This level has medium difficulty and you need to use good trick to complete this level. For this level you should try to play from the bottom to shuffle candies and take ingredients to the bottom plus make special candy as you get the chance. Try combine special candies to each other to take ingredients to the bottom fast to reach the target within 30 moves. 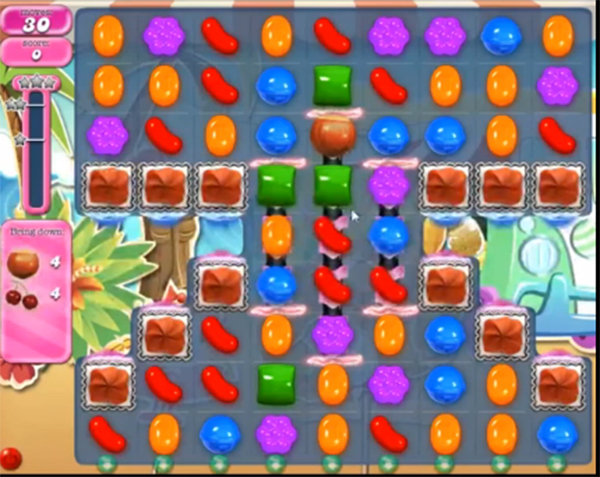 I would have gotten through this level 903 except one time the last cherry never dropped from wherever. I had over 12 left. The second time that I would have gotten through this level 903, all 4 cherries and 4 acorns did appear, but I was not given credit for getting all 4 cherries. It showed 1 cherry to go and I had gotten all 4 cherries down. What gives?